“RGI Next – Shape Your Business” took place on October 10th, in the prestigious setting of the Langhe Area, involving more than 100 professionals from Insurance and technology companies. RGI Next is the annual corporate event during which RGI Group offers its vision on technology and business trends. The event had “technology” as central theme, as the key element of the Insurers’ business processes digital transformation. The topic has been addressed through presentations, industry analysis and through an innovative technology show. 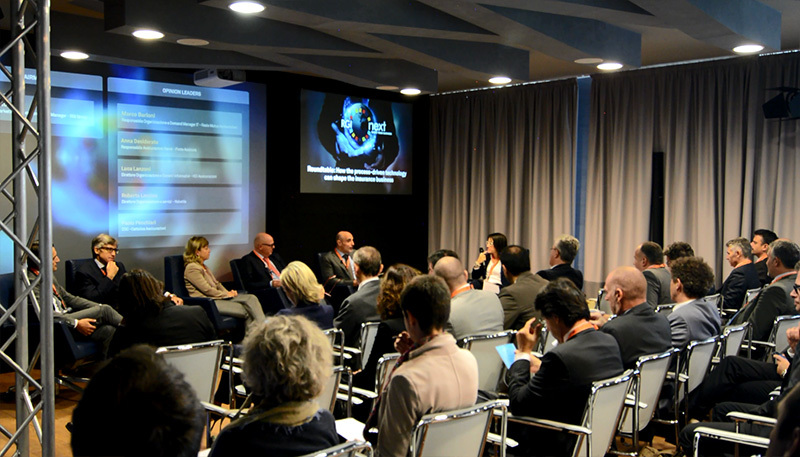 RGI Next – Shape your Business ended with a round table among the key opinion leaders of the insurance market. Vito Rocca, RGI Group’s CEO, held an Opening Keynote, explaining why the insurance market should shape its business, and which are the trends and evolutions affecting Insurers’ business processes. Francesca Sesia and Massimo Arrighi, from ATKearney, held a speech on “Innovating the business – Key Trends”, offering a snapshot of the digitalization phenomenon ad its impacts on the today Insurer. The event got into the near future with the tech Show “Look Ahead – Digitalized Business Processes”, held by RGI Group’s Presales Director Ugo Di Iorio, who went through the adoption of a digitalized operating model showing its application within 5 use cases. The day ended with a roundtable with 5 Insurers’ opinion leaders that gave their points of view on the topics discussed during the morning: Marco Barioni (Organization & IT Demand Manager – Reale Mutua Assicurazioni), Anna Desiderato (Non-Life Manager – Poste Assicura), Luca Lanzoni (Organization & IT Director – HDI Assicurazioni), Roberto Lecciso (Organization & IT Services Director – Helvetia), Paolo Pecchiari (COO – Cattolica Assicurazioni). The roundtable, chaired by RGI Group’s Corporate Marketing Manager, Elena Pistone, was the perfect occasion to share ideas and visions on the key topic of the day:“How the process-driven technology can shape the insurance business”.